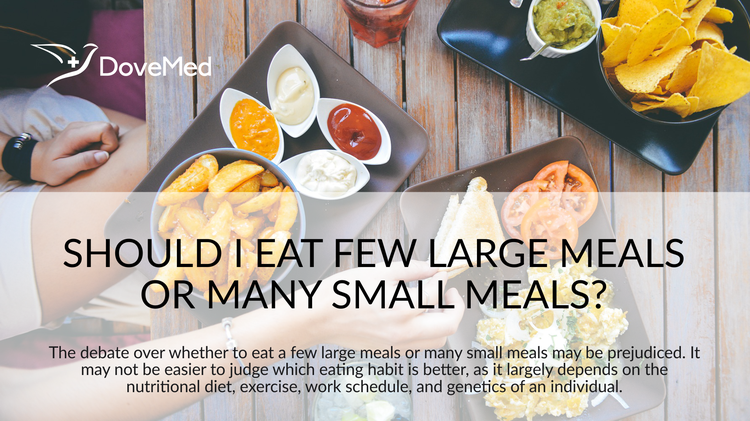 Should I Eat Few Large Meals Or Many Small Meals? The eating patterns have kept varying ever since urbanisation developed. Thus the debate over whether to eat a few large meals or many small meals may be prejudiced. Yale University History Professor Paul Freedman, Editor of Food: The History of Taste says, “There is no biological reason for eating three meals a day. Human beings are comfortable with patterns because they're predictable.” The eating patterns have kept varying ever since urbanisation developed. Thus the debate over whether to eat a few large meals or many small meals may be prejudiced. It may not be easier to judge which eating habit is better, as it largely depends on the nutritional diet, exercise, work schedule, and genetics of an individual. Eating patterns can influence and control one’s blood glucose levels. It is not how you eat, but what you eat keeps you healthy. After having a meal, blood glucose levels rise; insulin is secreted to combat the rising levels. In order to keep the glucose levels under control, typically diabetologist recommend having smaller frequent meals a day. This can keep your insulin levels under control. But on the contrary, on eating frequent small snacks the body is forced to secrete insulin for every meal, overworking the pancreas. Apart from this, it results in high blood pressure and insulin resistance. Adding nuts and beans to one’s diet can help control any spike in insulin levels. The good part about having smaller meals is that your stomach shrinks over a period of time on account of consuming less food. Eat food that can help you stay hunger-free for long. A healthy diet includes fresh vegetables and fruits combined with lentils. Cutting on carbohydrates and focusing on fibre rich food can keep you free from craving for food. Stop worrying about the quantity you eat; though, do focus on the quality. Research results go to prove that the effect on the meal size and frequency can increase cardiac output. Four healthy individuals were given small and large meals at intervals and their postprandial (after food) cardiac output was examined at the end of two hours of consumption of the meal. The difference of heart rate and stroke volume varied in persons that had a small meal and a large meal. The cardiac output was high even after 2 hours of consuming a large meal than those who consumed a small meal. Meal timing can vary from one individual to another. Factors like lifestyle, work timings, and food availability, can affect your meal times. It does not matter when you eat, how many times you eat, as long as you stick to a healthy diet and a smart way of life. The bottom-line is that instead of debating on whether to eat few large meals or many small meals, it is best to concentrate on getting a healthy diet coupled with adequate exercise. Department of Physiology, University of Oslo, Norway. Wolff, G. E., Crosby, R. D., Roberts, J. A., & Wittrock, D. A. (2000). Differences in daily stress, mood, coping, and eating behavior in binge eating and nonbinge eating college women. Addictive Behaviors, 25(2), 205-216. Rozin, P., Kabnick, K., Pete, E., Fischler, C., & Shields, C. (2003). The ecology of eating: smaller portion sizes in France than in the United States help explain the French paradox. Psychological science, 14(5), 450-454. Niego, S. H., Kofman, M. D., Weiss, J. J., & Geliebter, A. (2007). Binge eating in the bariatric surgery population: a review of the literature. International Journal of Eating Disorders, 40(4), 349-359. French, S. A., Story, M., & Jeffery, R. W. (2001). Environmental influences on eating and physical activity. Annual review of public health, 22(1), 309-335.